Black Diamond Titanium Engagement Ring : LOVE2HAVE in the UK! An affordable tension set diamond titanium engagement ring set with a black diamond. This tension set titanium ring makes a lovely engagement ring for a woman as it is quite subtle in styling. It has a width of 3mm, and the black diamond is 0.05pt in size. It is pictured here in a satin finish, but it also comes in a polished finish too. Black diamonds make a great alternative to the more traditional white diamonds. 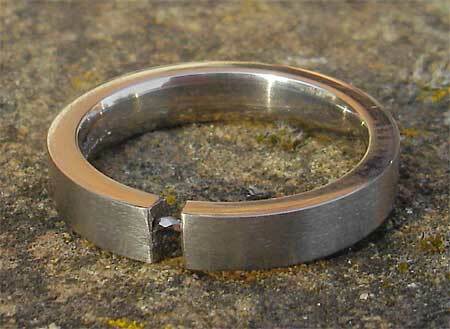 They give your engagement ring an unusual look and made from titanium too; they are very contemporary. 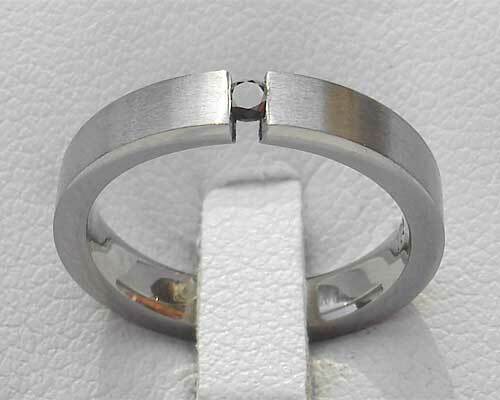 A matching plain wedding ring is also available, so please email us for further details. Precious stone(s) Available: 1 x 0.05pt black diamond. Finish(es) Available: Polished or satin matt. Returns Policy: You may return this UK made titanium engagement ring if it is not to your satisfaction as long as it is not engraved. Please see our terms and conditions.